The elegant frontage of the church sits rather surreally in a narrow terraced street just to the north of Woodbridge's elegant main street. 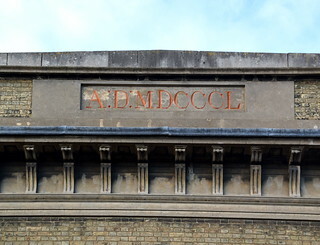 High above the entrance an inscription reads AD MDCCCL, but in fact this building had a life of nearly eighty years before the Catholic parish took it on and made it its church. At street level the church appears to have two separate frontages, and this is exactly right, for until relatively recently this was two separate buildings. The Catholic Church returned to Woodbridge quietly as the penal years came to an end and Catholicism was decriminalised in England. 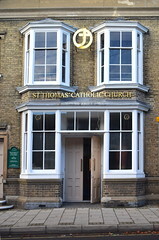 Eight miles away on Woodbridge Road in Ipswich, Pere Simon, a refugee from the French Revolution, established the church of St Anthony in 1827. 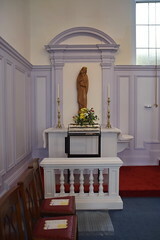 This was a small church set back from the road, but a need for expansion rapidly became clear, not least because of the large number of Catholic Irish soldiers at the nearby, and in 1838 the old church became the transepts of a much larger church dedicated to Our Lady of Grace, the name of Ipswich's famed medieval shrine. It was thus possible for Woodbridge's Catholics to travel to the Ipswich church for Mass, but in fact there were not very many of them. The 1801 census recorded just four Catholics living in Woodbridge, and there were only sixteen as late as 1880. In March 1865, a house in Church Street saw what is believed to be the first Catholic Mass celebrated in the town since the Reformation. Before the Church of England came along, of course, the Catholic Church had been the stewards of the great medieval church of St Mary, a few hundred yards off, and one of the grandest churches in the Kingdom. Celebrating Mass after a break of more than three centuries in the front room of a private house provided quite a contrast. But it must have been a moving occasion, and was in any case a beginning. 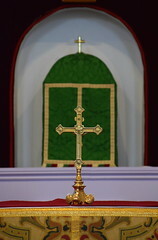 By 1869 Mass was being celebrated monthly, and an old warehouse was fitted out with an altar and tabernacle to be the first proper home of the sacrament. Two years later the Ipswich priest Father Wallace bought a piece of land in Crown Place, and a small church was built, paid for with money he had received for working as a Catholic chaplain to the British Expeditionary Force in Africa. 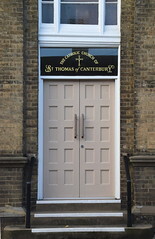 The church was dedicated to St Thomas of Canterbury. Photographs show a small red brick church with a simple bell turret. There were attempts to establish a resident priest, but this did not become permanent until 1919, when Father William Cooper arrived, recuperating from ill-health. He seems to have galvanised the parish, and importantly invited two religious communities to relocate to the town. The most important of the two was a community of Carmelite nuns from Notting Hill, who established their convent in Cooper's house in Church Street, while he moved to a flat in Hasketon Manor. The Sisters of Mercy established their convent in Castle Street. 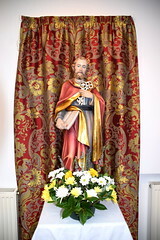 In 1922 Father Ernest Shebbeare became priest, and chaplain to the Carmelite convent. A former Anglican, Shebbeare had been a priest in the hot-housed Anglo-Catholic parishes of Brighton. In 1923 the Carmelite community was joined by a former Anglican who took the veil under the name Sister Margaret of the Mother of God. She was the stained glass artist Margaret Agnes Rope. Although Margaret was born in Shrewsbury, the Ropes were a Suffolk family, based in Blaxhall and shortly to marry into the Jolly family of Kesgrave, just outside of Woodbridge. The family would be important in the 20th Century story of the Church in east Suffolk. Margaret Rope continued her stained glass work in Woodbridge, sending designs to the Glass Hpuse in Fulham to be cut, and produced some of her most famous work in this period. Today she is considered at the highest rank of female English artists of the first half of the 20th Century..
Woodbridge parish had recently been in receipt of a considerable bequest, and Shebbeare saw that the time was right to acquire a new church, for the old one was now much too small for the regular congregation of 75 or so. 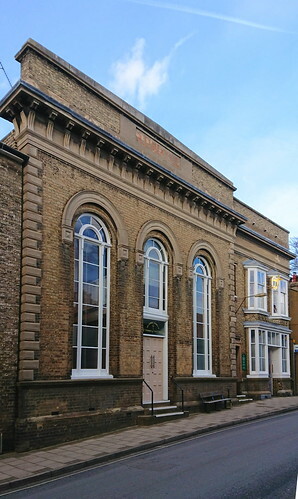 Rather than build something new, the parish negotiated for the purchase of the public hall in St John's Street. This had been opened in 1850 as the Temperance and Lecture Hall, later as the home of the Mechanics Institution, and then the YMCA. 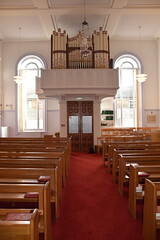 The building was sold to the parish for £1200, and then turned into a church in the classical style for £2000. 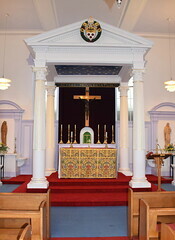 This seems a lot, but no expense was spared, and much of the money went on a spectacular neoclassical baldacchino. 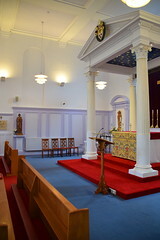 The architect was Arnold Crush, and much of the decoration was the work of parishioners and sisters of the Carmelite convent, including Sister Margaret of the Mother of God and another former artist, Sister Rosario. 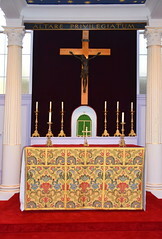 Mass was celebrated for the first time in the building in March 1931. 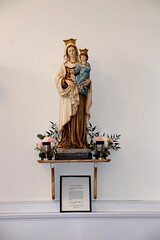 The Carmelites left Woodbridge just before the start of the Second World War, finding a temporary home at Rushmere in the suburbs of Ipswich before finally settling at Quidenham in Norfolk where they remain today. You step into the church through the entrance to the former hall to east of the main building, and find yourself in a wide, light galilee area, separated from the church itself by a glass screen. 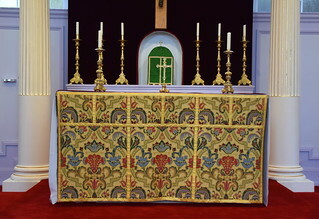 You step though this screen into the further light and colour of the annexe beside the altar, into a feeling of freshness and quiet beauty, for although there were minor alterations to the church in the 1970s as a result of the Second Vatican Council, a great refurbishing came in the second decade of the 21st Century. Turning to the left you enter the main body of the church, the grand baldachinno above the altar facing towards an equally grand organ gallery at the other end. Because this is not a log space, their proximity to each other intensifies their presence in an otherwise simple space. 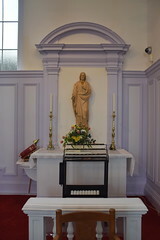 The wooden panels along the walls, now repainted in a delicate lilac shade, emphasise the tranquillity out of which the glory of the altar seems to burst. 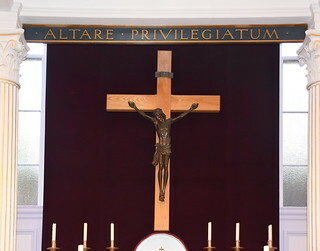 The columns have been regilded, the stars in the canopy are a recent addition, but the inscription along the back, ALTARE PRIVILEGIATUM, is from the late 1920s, and the work of Margaret Agnes Rope. Devotional statues do not intrude. 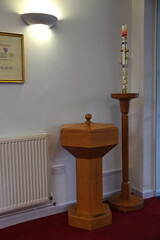 There is a wooden font in the annexe, and a modern copy of an octagonal 15th Century East Anglian font, which in the late 1990s I had found beside the altar, is now set by the entrance. 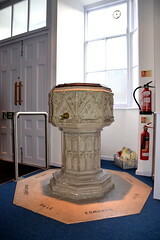 An inscription around the base reads <i>Pray for the soul of Anita Margaret Pole Edmunds</i>. No one seems to know where it came from. This is a lovely space, but unfortunately it is not open outside of Mass times. 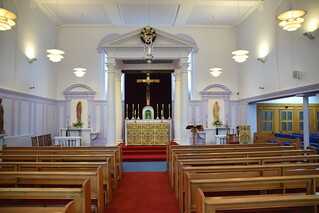 Woodbridge parish is very large, and few parishioners live in the town itself. Because of this, the decision has been taken to keep the church locked to visitors, but there are hopes that it may be possible to open at least the galilee area in the future. 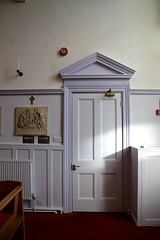 Until then, you'll need to contact the parish priest if you want to see inside.